Learn How much and how often should I feed my puppy? You’ve got your scoop. You’ve got your bowl. You’ve got your big bundle of puppy food. Now it’s time for the hard part - measuring it all out! With your puppy growing at such a lightning-fast rate, it can be tricky keeping track of how much and how many times a day they need to be fed. 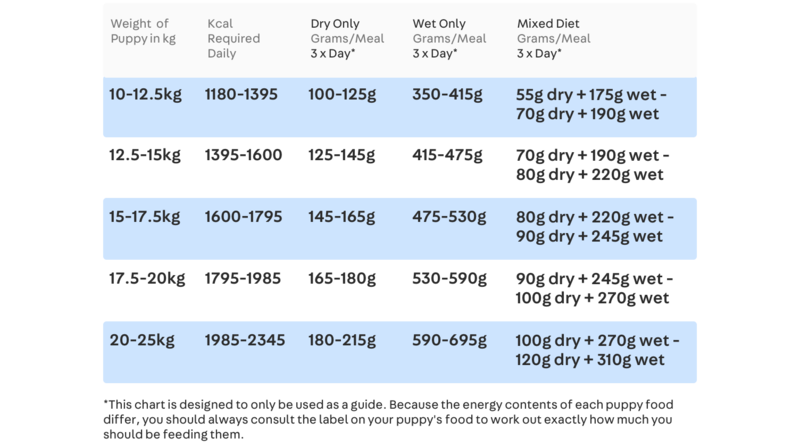 So to help take some of the guesswork out of the minefield that is puppy food measurements and calorie counting, Paws vet Steph has developed this feeding chart to help guide you, and your pup, all the way through to adulthood. 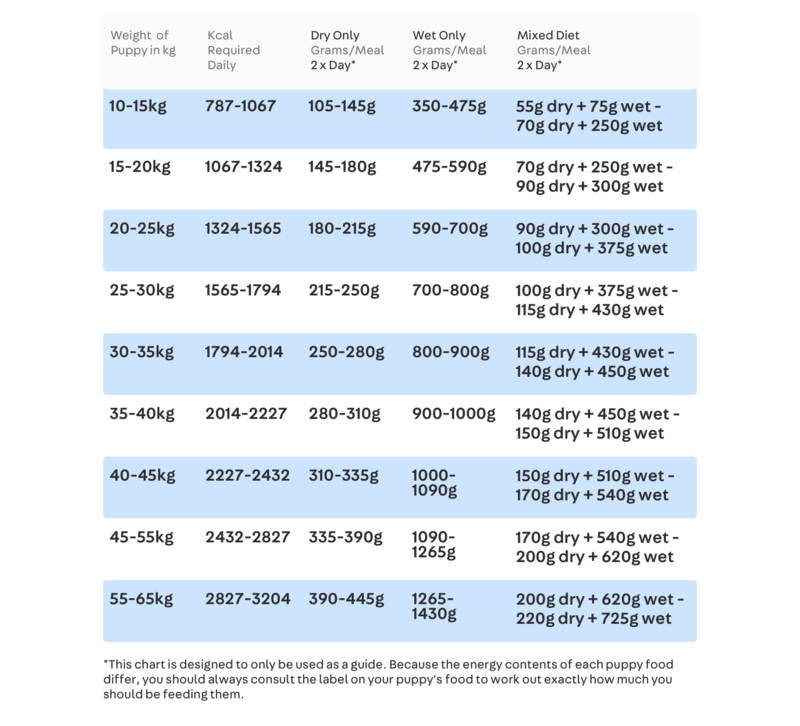 It’s important to note that the feeding frequencies recommended in the charts above are exclusively based on weight. While weight is a useful marker of how often your pup needs to be fed, other important factors include their breed and age. Since smaller breeds have tiny tummies and fast metabolisms (#soblessed), they tend to fare better with smaller, more frequent meals. Whereas larger breeds will be better off with fewer, larger-sized meals. How will I know that I’m getting my puppy’s portions right? One of the best indications that you’re feeding your puppy too much or too little is the rate at which they’re growing. If they’re growing too fast, it could be a sign that you’re feeding them too much. Whereas if they’re lagging behind, it could be a red flag that they aren’t getting all the nutritional goodness they need. 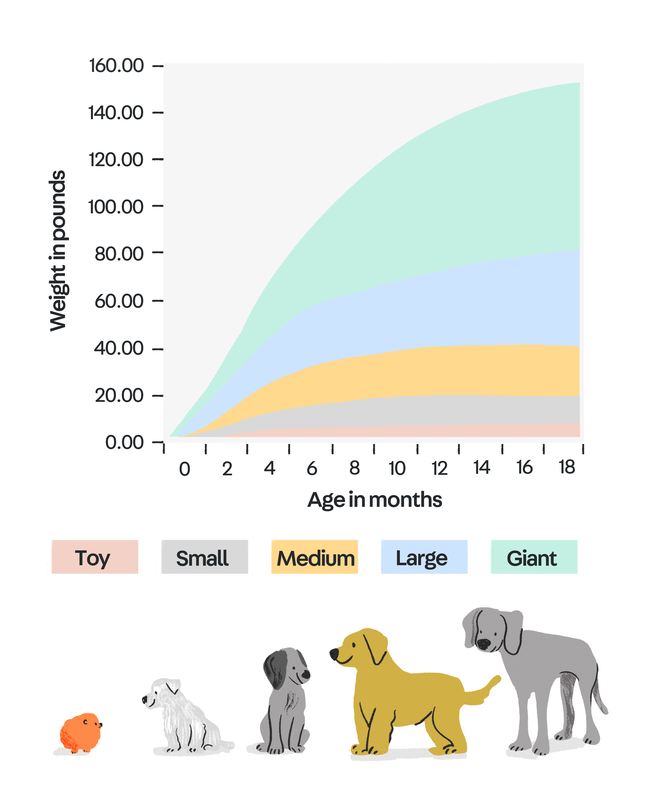 To get a sense of how your pup is tracking, compare them against their size and age category in the chart below. If you still have any questions or concerns after that, be sure to consult your vet or get in touch with one of our Paws experts at experts@paws.com. They'd be more than happy to talk you through your puppy’s expected growth markers and help you work out exactly how much you should be feeding them.